I remember the chill I felt when I heard, for the first time, the phrase 'collateral damage.' Collateral damage is the mangling and killing of innocent bystanders who happen to be in the immediate vicinity of deadly force, that is, in the wrong place at the wrong time (even if the place is a person's own home). The phrase also allows those who use it to avoid responsibility for their actions, intentional or not. 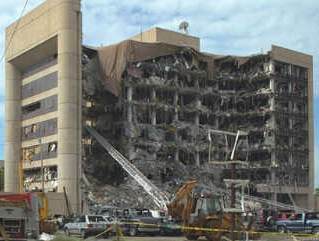 Building in 1995, only added to the horror of his act. Former Senator Bob Kerry's regret for the collateral damage of at least 13 women and children (killed in a Mekong Delta village in 1969 by a SEAL unit he led) has received a different public response. Still, the use of violence in both cases led to collateral damage. Collateral damage is part of that deliberately deceptive language created by the military and government: 'protective reaction strike' being their euphemism for 'let's bomb the hell out of them whether they plan to bomb us or not' and 'smart bombs,' touted for their accuracy (but, when linked with un-smart people or even clouds, unerringly wipe out another country's embassy, a refugee train of friendlies, and a hospital). Yet, surprisingly, I have found collateral damage a helpful concept to describe some human behaviors. For example, we are aware of the destructive effect of alcohol abuse on the drinker. Much less is said, and much less is done, about the deleterious effect of collateral damage on innocent bystanders and society. The spectrum of this collateral damage includes alcohol-related violence, road accidents, family problems, spousal abuse, alcohol abuse by doctors and other professionals, violent crime, and the resultant financial burdens incurred by society. being maligned, and the little white lie that excuses my behavior. Judging others also includes judging myself. I find this to be an uncomfortable part of collateral damage's collateral damage.